Department of Psychiatry and Medical Psychology, Medical University – Varna, Bulgaria. The psychoneuroimmunology, the new brain science and the endocrinology today show a lot of results, with which symptoms are better to understand. The psychotherapeutic practice shows the ways to influence them by encoding the levels of bounding between the physical symptom and the psychological condition. The aim of the study was to show the encoding of the psychosomatic arc within a real psychotherapeutic contact. 59 psychotherapeutic cases are followed. 33 of them were with somatoform disorders and 26 with chronic psychosomatic diseases. Every patient has minimum 12 psychotherapeutic sessions. The treatment is provided on the base of the 5 levels model of the positive psychotherapy. Key words: Psychosomatic arc, connection between unconscious – fixed emotion – symptoms, positive psychotherapy. Please cite this article as: Boncheva I. Psychosomatic "Arc" in the psychotherapeutic practice. J of IMAB. 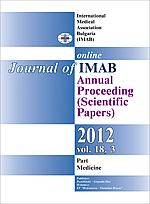 2012; 18(3):330-333. doi: 10.5272/jimab.2012183.330. 2. Ahrens St. Lehrbuch der psychotherapeutische Medizin, Stuttgart, Schattauer, 1997; 688 pages. 6. Lorentz MM. Stress and Psychoneuroimmunology revisited: Using mind-body intervention to reduce Stress. Alterna J of Nursing Switzerland. 2006 Jul;11:1-11. 7. Peseschkian N. Psychosomatik und positive Psychotherapie, Springer, Muenchen, 1991. 8. Peseschkian N, Boessmann U. Angst und Depression im Alltag: Eine Anleitung zur Selbsthilfe und pozitiver Psychotherapie. Frankfurt a.M., Fischer, 2007.